Three Months And A Wellingtonian Yet? The jury is still out. It is too early to tell. But I am trying. Last month I visited Auckland for a weekend. As the Airbus rumbled along Dominion Rd I noticed the new shops that had sprung up. An entire road the size of Lambton Quay, Courtenay Place, Cuba Mall, other bits of central Wellington put together. Buzzing and vibrant. DIVERSE. Then I told myself I should not complain, I should try. I got my first parking ticket in the last week of April. Signs of settling in, I think. Still to find the mythical free car park but I have an infringement notice. Meanwhile I continue to battle the low water pressure. You see, the shower rose goes through the cold water first before it can deliver any water that is warm. See this contraption? That is the two tap pipe that brings water from the cold tap and hot tap through a single pipe into my bucket so I can have a decent bucket bath. Selling like hot cakes in the low pressure plumbing world of Wellington. My landlady’s plumber told her there is no hot water problem when I complained. He, I assume, who can live without his clothes in Alpine conditions, shrivelled body parts and potentially damaged lungs. So I have third world problems in a first world country. Bucket baths in a bathtub not built for that purpose. 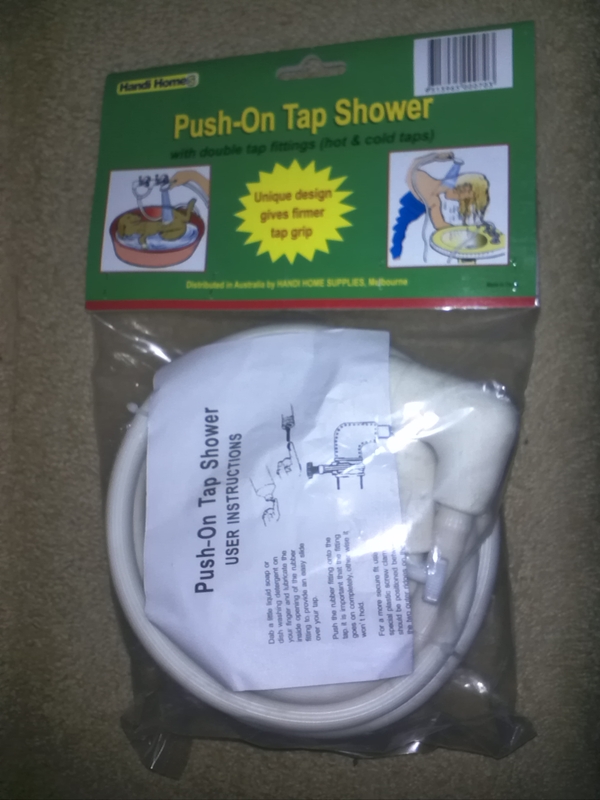 This contraption cannot be used as a shower because guess what happens when the pipe is lifted above the level of the taps? Physics, my dear Watson. The shower is now part of my imagination. Aren’t we migrants lucky to be hardy? And then we stand up to make noise and complain. 😀 She ain’t gonna be right ‘coz she need fixing. A friend once said to me that the pioneers who came from ye olde England/Scotland/remnants of the British Raj always wanted to go ‘back home’ so they built cold, damp houses here which constantly reminded them that it was temporary. Think. Any new settlers would learn from the natives about habitation that suits the local climate. Warm and dry in the winter, relatively airy in the summer. Instead it was all about civilising the barbarians and imitating buildings from ‘home’. Then all got asthma and/or Chronic Obstructive Pulmonary Disease, suffering from their ill abodes. Which bright spark would build a low pressure water system across the hills of Wellington? Hence I wash my thick, long hair from a bucket. But like I said at the top, no more complaining. It is important to try and my philosophy in life has been to take charge of things so I can make the change. If I believe Wellington needs to be more than four streets and the five hipsters who work at start ups or in the creative industry, if this city needs more diversity, more migrants, more commerce, a united region, an international airport out beyond Whitby or those parts and outspoken leaders; new blood, not the fuddy-duddy, marbles-in-the-mouth Pakeha minority with a blinkered world view then I am going to work on it. So next week I am meeting Jack Yan‘s team to see how I can help him for the Wellington mayoral elections. Considering that I might be living here for the next few years and might become a Wellingtonian yet. By the way, Wellington does have a wonderful public transport system. Except that the last bus leaves the airport at 8.30pm. This entry was posted in Angst and anxiety, Culture, Loving Aotearoa New Zealand, Politics and tagged Wellington by drsapna. Bookmark the permalink.